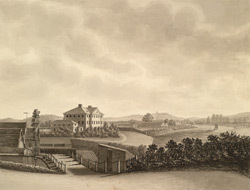 View of Hereford General Infirmary (now known as the Hereford General Hospital) by S. Fisher. The Hospital stands in Nelson Street and overlooks the River Wye. The oldest part of the hospital was built in 1779-83 and it is thought that William parker was responsible for the work. The Hereford Guide of 1796 calls it ‘commodious and elegant’ as it is three storeys high has a five bay pediment and nine bays in total. The building of the hospital was the result of sixteen years of campaigning by figures such as the Rev. Dr. Thomas Talbot who wanted the provision of medical care for the poor. The Infirmary had many rules governing which members of the public could be admitted for treatment, for example patients with infectious diseases such as smallpox were refused as were women in childbirth and children under the age of seven years. Patients originally had to be sponsored by someone who had donated money to the Infirmary. Each sponsored patient was given a ticket and they had to arrive at the hospital at 10 o’clock am bringing with them their ticket and two clean shirts.